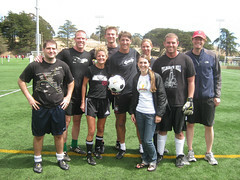 Yesterday we won the first Startup Cup soccer tourney. Really fun single elimination tournament organized by Weebly that included Footballistic, Slide, Square, TechCrunch, Scribd, Uservoice, Revision3, Xobni, Box.net, WePay and Kabam. Here's the Flickr set. 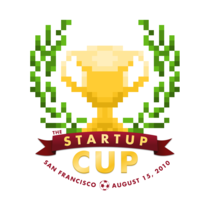 There really should be more startup events like this, and the infamous Bowling 2.0 which we won back in 2006. The matches were hard-fought, and much sweat (and some blood) was spilled as each company vied for the top prize. In the end, SocialText came out the leader, led by company cofounder Ross Mayfield . And there were no losers: everyone got free Chipotle burritos and Subway sandwiches. I’ve never seen so many burritos at once. It was beautiful.